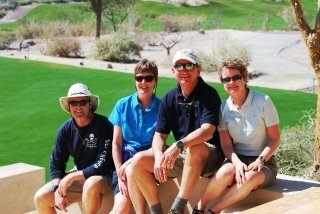 As it is too cold at home to do much boating, we were searching for a new adventure when we received an email from Marty and Suzanne, fellow Krogen owners and good friends. 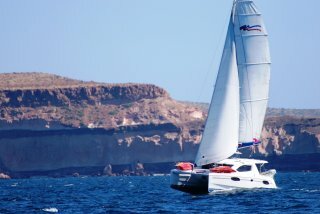 The magazine Cruising World is sponsoring a trip to the Sea of Cortez in Baja,Mexico. Suzanne and Marty are going and asked if we would like to join them. Of course we would!! I know, it is the dark side for us trawler owners, but after all it is only for a week. Idyll Time is getting some tender loving care while we are gone (bath and gel coat waxing). We just won’t mention to her that we are vacationing on a sailboat, after all she is the jealous type. 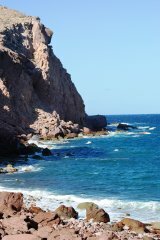 The Sea of Cortez, officially named The Gulf of California, is the body of water that separates the Baja California Peninsula from the Mexican mainland. The waters here are reported to be some of the most diverse on the planet. Grey and humpback whales migrate here each winter. It’s more than 900 islands are nesting sites for thousands of seabirds and the surrounding waters are nursing sites for the myriad of fish species that visit these seas. The Baja peninsula split away from the mainland of Mexico over 20 million years ago. 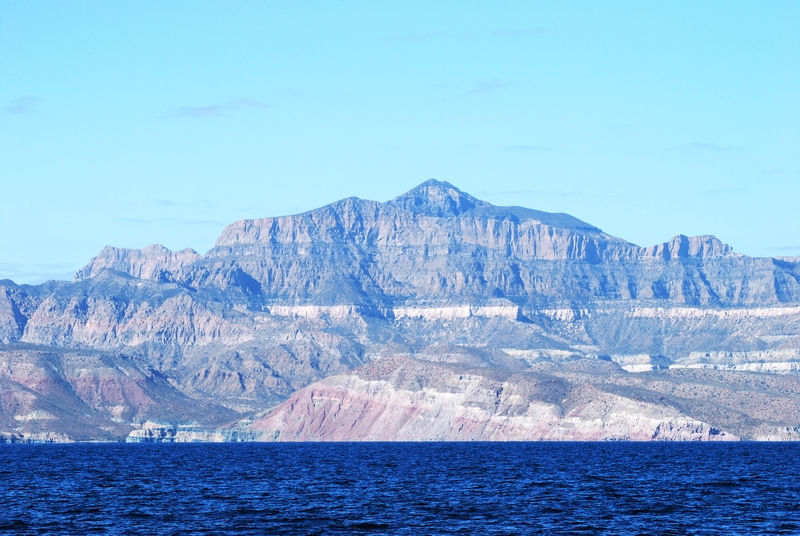 Most of Baja is a desert with the mountain range rising almost vertically from theSeaofCortez. Civilization here is almost nonexistent with only a handful of fishing villages dotting the shoreline. Boaters looking for marinas, restaurants, and nightlife will not enjoy this area. If however you enjoy great scenery, lots of wildlife, quiet anchorages, and solitude then this is the place for you. It sounds perfect to us so here we go. 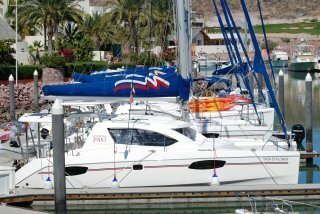 After a 3 hour drive from the airport at Cabo, we arrive in La Paz, Mexico which is the headquarters for the Moorings Charter boats. Suzanne, Marty, Jeff and I will be captaining a 3900 Robertson and Caine catamaran for our week long trip exploring the Seaof Cortez. We are allowed aboard Balajan, our 39’ home for the next week at 4:00 PM. A quick search and we learn that the translation of Balajan is “The best girl you will ever come to know; loyal, adventurous, funny, and extremely beautiful.” This seems appropriate for our vessel. The Moorings have provided complete provisioning for this trip as there will be no towns or villages for re-provisioning along our route. Suzanne and I do an inventory of our supplies while Jeff and Marty check out the boat mechanical systems. Everything seems in perfect order. This evening we have a get together dinner at a restaurant overlooking the marina where we meet our fellow cruising partners. We will have a total of four boats and 23 people in our flotilla. It looks like us Krogen owners are the only power boaters from the group as all the others are sailboat owners. Marty, Suzanne, and Jeff do however have extensive sailing backgrounds. We should be able to hold our own with this group. 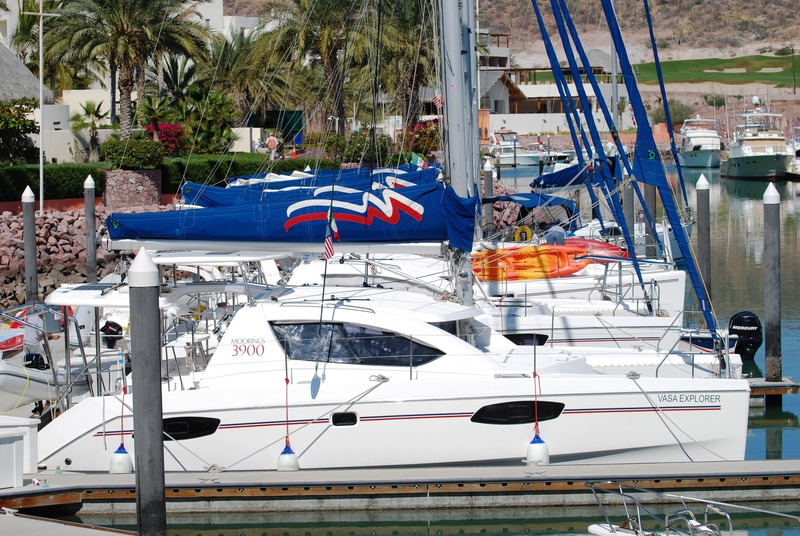 Peter and Carol King, owners of the charter company for Cruising World, will be captaining the lead sailboat along with a local captain, Jim, who has cruised the Sea of Cortez for the past 20 years. The nautical charts for this area are not very accurate and having someone with local knowledge traveling with our group will be invaluable. We are chomping at the bit to get under way early this morning. First the formalities must be taken care of. Marty and Jeff attend a captains briefing along with the three other boat’s captains. Suzanne and I take this time to check Balajan’s spares. We finish our onboard boat briefing at 11:00 AM and are given the all clear. All four boats push away from the docks almost simultaneously and we form a grand parade as we motor out of the marina harbor. 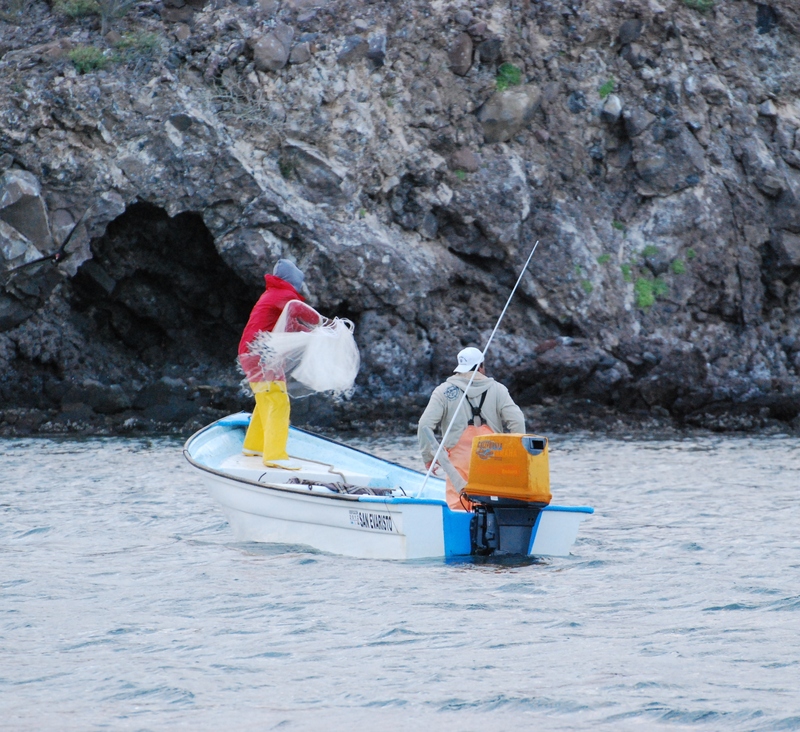 Our first few hours in theSea of Cortez are not very kind as the seas are rough and confused. 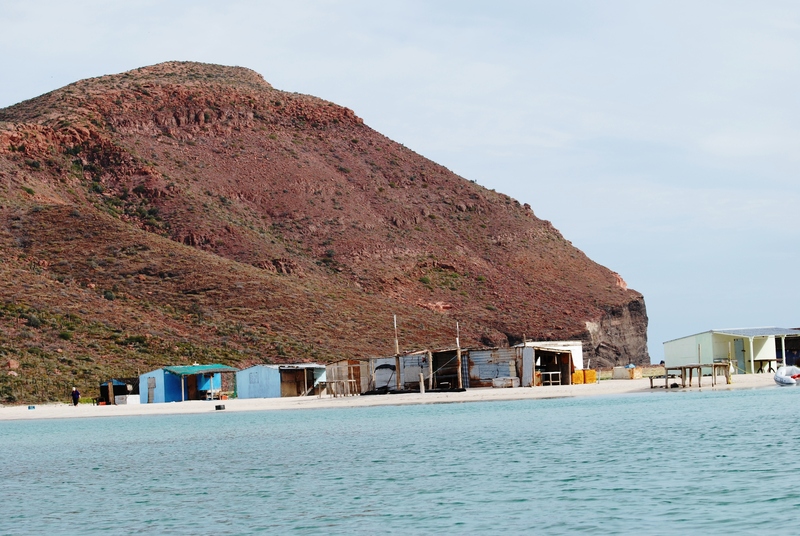 16 miles north of La Paz, we anchor in the cove of Bahia San Gabriel on theIsland ofEspiritu Santo for lunch. After a few hours, we weigh anchor ahead of the group as we are eager for some sailing time. We soon have the main sail raised and spend the next few hours searching for whales. 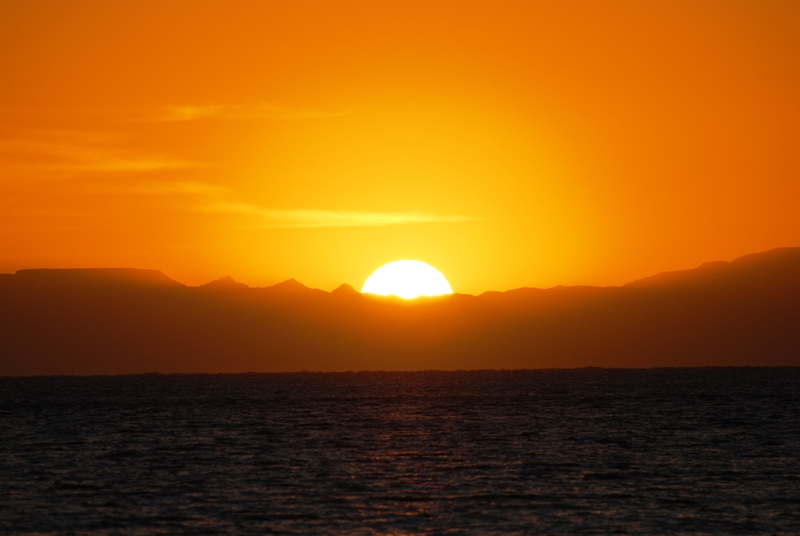 The sun is just touching the horizon as we pull into our evening anchorage of Caleta Partida. We are the last boat to arrive as all of the others did not sail today. They all motored into the anchorage. 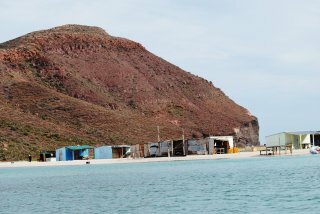 This is one of the most protected anchorages around, as we are anchored between the two islands of Espiritu Santo and Isla Partida. We are completely surrounded by the mountains that rise from the shores of these two islands except for a small shallow strait that separates the two. 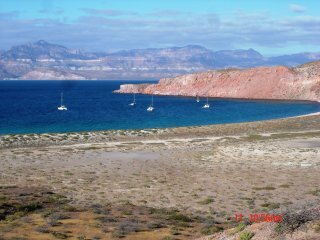 This morning we dinghy ashore to explore the small fish camp that is on the beach at Caleta Partida. The 12 ramshackle wooden shacks and rusting freezers are deserted. Not a soul is around. They must have generator power at some time as there is a satellite dish attached to one of the shacks. 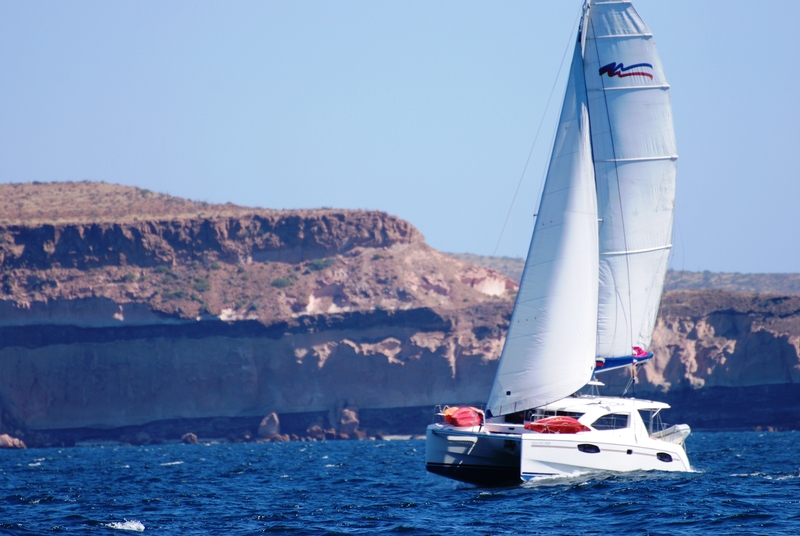 Back aboard our catamaran, we have a short 6 mile trip to Los Islotes. The wind is blowing 20 knots and it is a cold 60 degrees. All the boats opt to motor instead of beating our way north under sail. 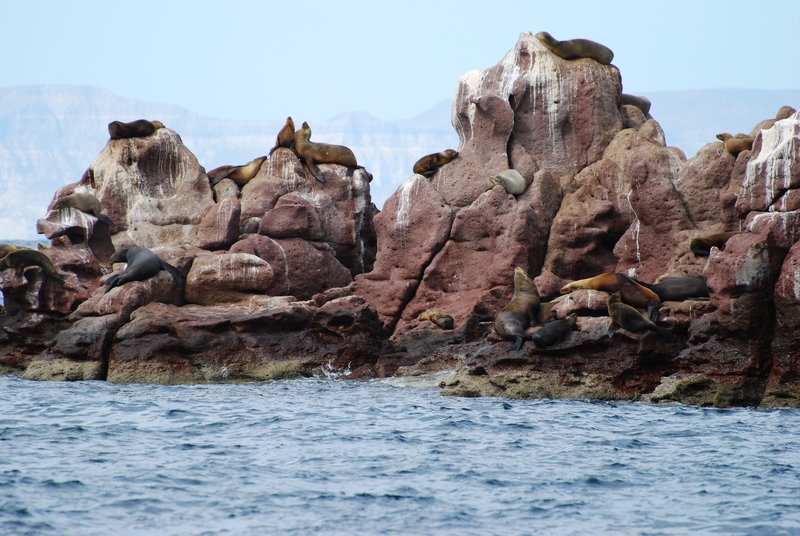 Los Islotes is a small rock formation just off the northern tip of Isla Partida. 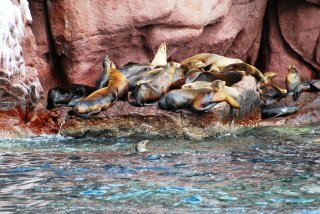 This is a national wildlife sanctuary and home to a large colony of sea lions. We had planned on snorkeling here with these magnificent creatures. With the cold rough water, no one is at all interested in a swim. 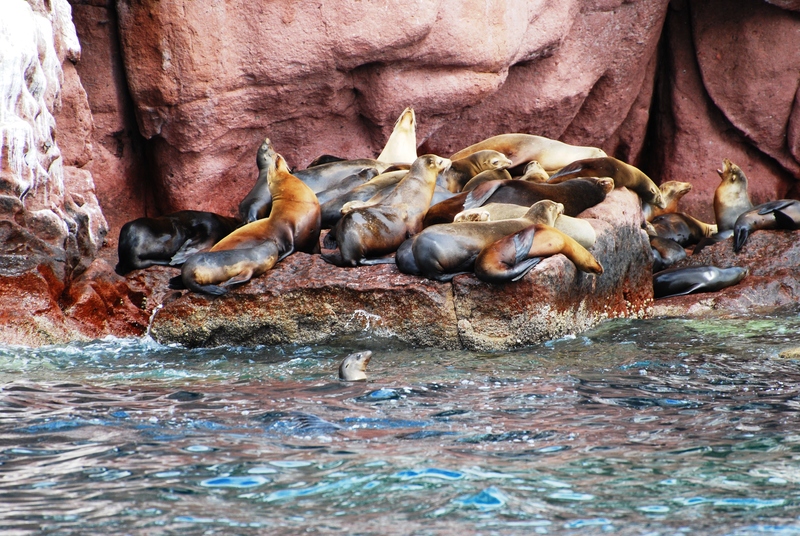 We enjoy our time here taking photos and observing the antics of these playful marine mammals from the boat deck. We hoist the sails on Balajan as we leave this protected outcrop and enjoy a 19 mile sail north to the island of IsleSan Francisco which is our anchorage for the evening. This horseshoe shaped cove with its white sandy beach and clear blue waters make a perfect evening stop. Just after arriving, a pod of dolphins greet us in the bay. We watch as they weave their way around the boats in their search for food. A local fishing panga appears and approaches our boat offering to sell us fish. They have no lobster so we decline. 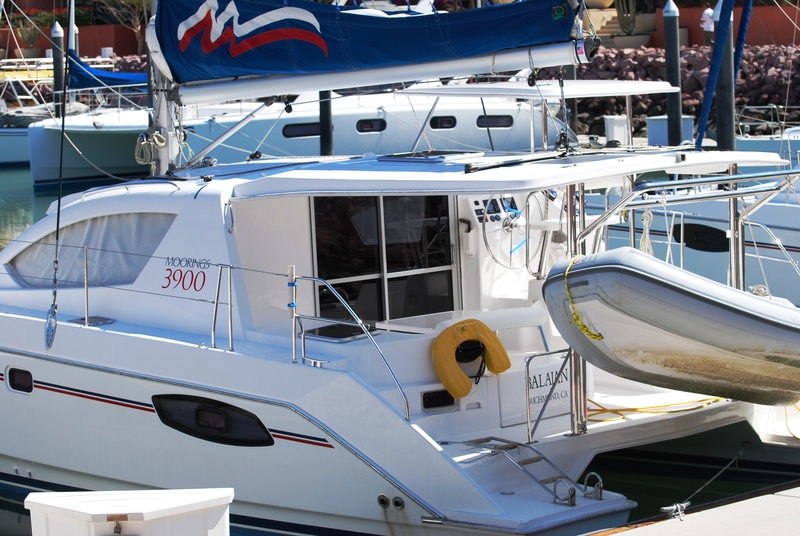 The Moorings has provisioned us with three large packages of fresh local fish so we don’t need any of that. This evening Peter from Cruising World hosts a beach party ashore. Boy does he make some strong Rum Punch! We enjoy spending time getting to know our fellow sailors and swapping boat stories. Everyone here seem to be very experienced boaters so this should be a fun week. As darkness approaches everyone returns to their boats very happy. The morning is spent exploring theIslandof San Francisco. 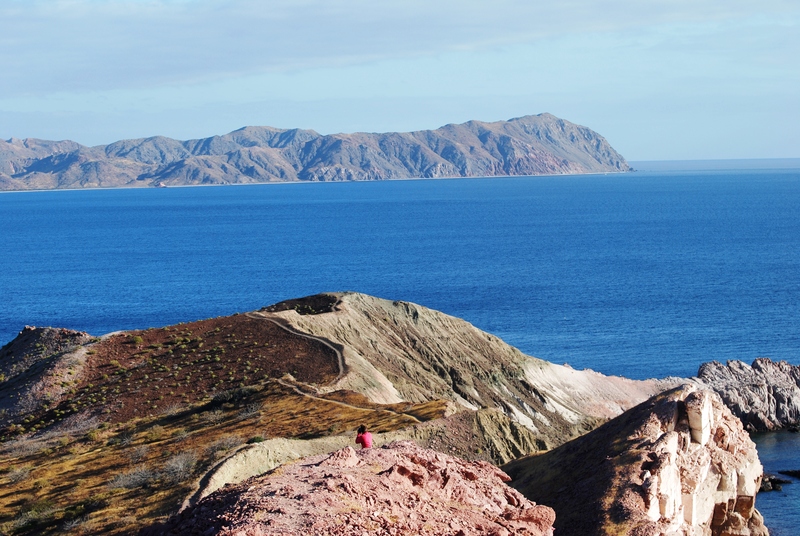 We follow a steep rocky trail which climbs a ridge to the highest point on the island 700 feet above sea level. 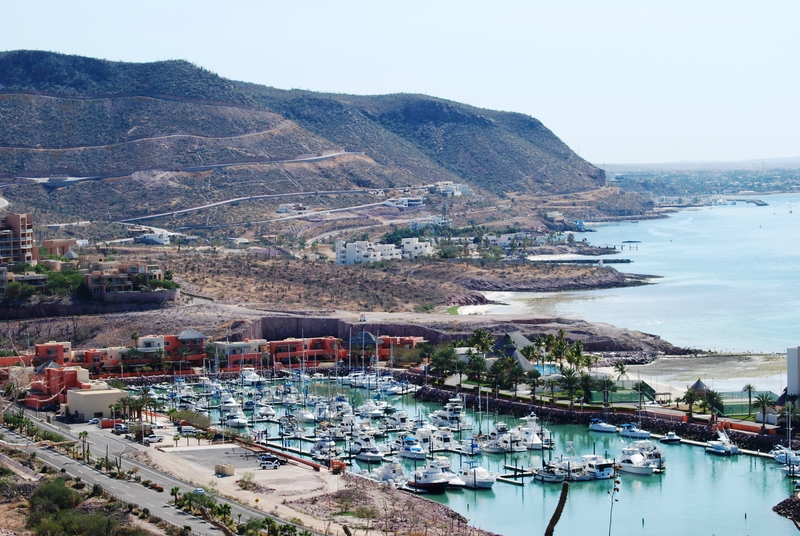 From here we have some magnificent views overlooking theSea of Cortez. Several whale blows are spotted in the distance. Descending down a much gentler trail, we discover numerous salt ponds on the island. 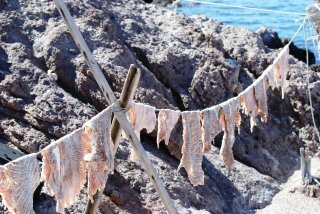 The fishermen must have dug these for use of the salt in curing their catch. We arrive back to our catamaran to discover a small cruise ship anchoring in the bay. The ship “Safari Endeavour” quickly unloads its tenders and shuttles several dozen life jacketed adventures to the island. It is time for us to find a more secluded anchorage. Our first stop of the morning is Isla Coyote just two miles north of San Francisco. This 40 ft. high rocky outcropping is surrounded by submerged rocks and ledges. Jim, our local guide, leads us into the shallow protected anchorage. This is one of only a few inhabited islands. A community of fisherman calls this little rock their home. We are welcomed ashore and given a personal tour by the patriarch of this community. The small collection of buildings is surprisingly neat and clean. 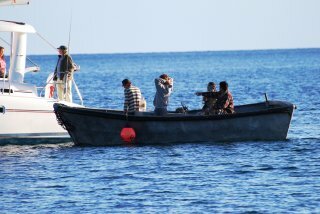 Most of the fishermen are off island now enjoying Carnival inLa Paz. Their catches of manta rays are undergoing a salt cure while they are away. Several of the women have a display of jewelry made from local shells. Jeff makes a great purchase from the patriarch of a hand made fishing lure made of whale bone. Another interesting artifact here is a skeleton of a hump back whale which washed ashore several years ago. 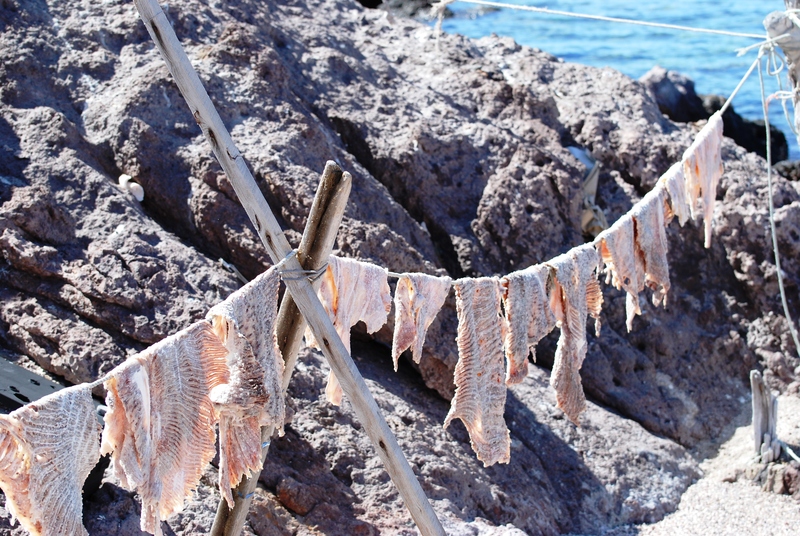 We feel fortunate to have been welcomed into this small fishing community. Back aboard Balajan, we leisurely weigh anchor as our second stop of the day on Isle San Jose is less than one mile east. 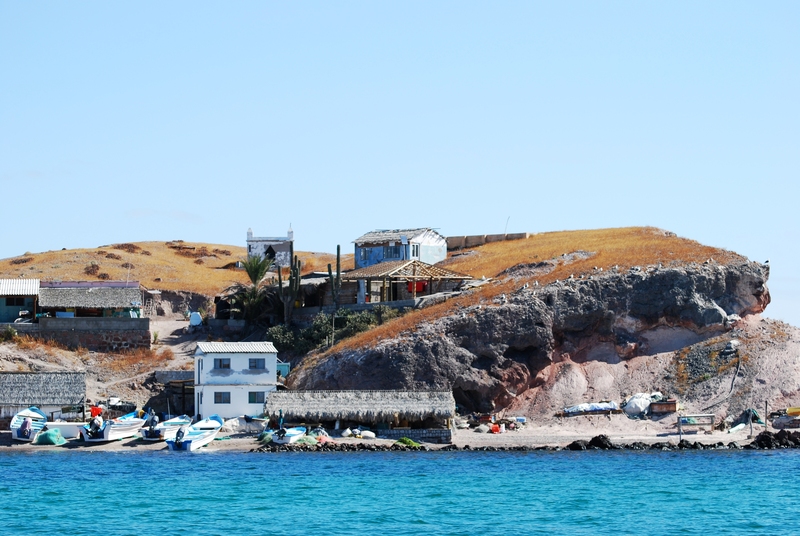 Once anchored in Bahia San Jose, we quickly deploy the dinghy to explore this volcanic island. It is quite a challenge navigating our tender into the protected marsh lagoon. We must first traverse several shallow tidal outflows. In a few spots it is necessary to haul the dinghy over the exposed sand due to the low tide. Once in deeper water we have a 3 knot current pushing against us. It was well worth the effort as the mangrove lagoon is quite wild and beautiful. Too bad we don’t have more time to explore this mile long channel thru the mangroves. On our way out, we beach the dinghy along the tidal flats to explore the forest of giant cacti just behind the white sandy beach. 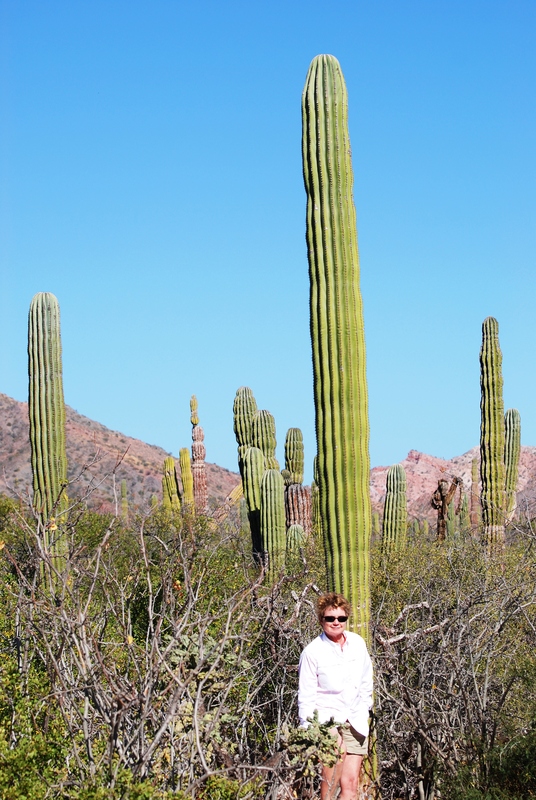 This island is home to the Cardon Cactus which is the world’s tallest cactus. They grow up to 60 feet in height and may reach up to 200 years in age. 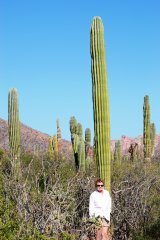 This area is unique in that more than 110 species of cacti are found in the Baja area and 80 of these are found nowhere else on earth. We are dwarfed by these stately giants and enjoy wandering through the area. 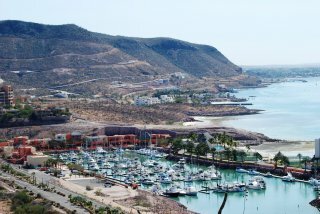 We depart San Jose at 4:00 PM for a six mile motor north to Caleta San Evaristo. There is no wind today and the seas are flat calm so the sails are of no use. We continually scan the horizon for whales but none are to be found today. Our only mammal sighting is a few dolphins frolicking at the surface. We enter the horseshoe shaped harbor at 5:00 PM and anchor a few hundred feet off of the broad sandy beach. This is our first anchorage on the Baja peninsula mainland. 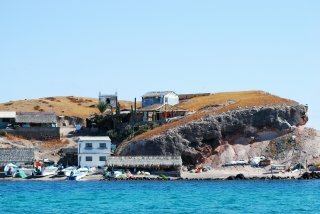 There is a small fishing village ashore with 20 permanent families along with a regional school and a desalination water plant. Our evening is spent aboard enjoying a great dinner of grilled pork chops, corn, and potatoes. 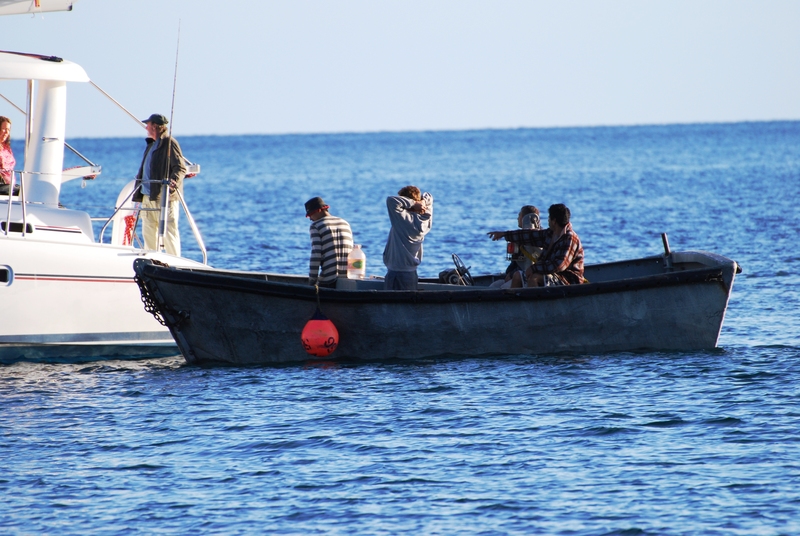 The local fishermen are out early this morning searching for bait in the harbor. We watch as they expertly throw their cast nets and haul in small bait fish. With their brightly colored foul weather clothing and beautiful wooden boats, they are entertaining to watch. The pelicans join in and fish along side them. Just as we were discussing the strong cold front and accompanying winds from the north that blew in during the night, we receive a VHF call from Jim, the local guide. He was able to get some local weather information from a friend of his. There is a strong Northern cold front bearing down on us and the winds will increase to 20-30 knots today and tomorrow. Our original plan of headed farther north in search of a pod of pilot whales is canceled. We are running south with the wind today as far as possible. Although we would have liked to gone ashore and explore this local fishing village, we opt to weigh anchor and get an early start. The seas will only continue to build through the day. We unfurl the jib and are the first boat out of the harbor. We run downwind all day with just our jib out. As predicted, the seas continue to build. We surf some 10 footers and the catamaran performs great. By running downwind our ride is relatively smooth but it would have been a whole different story if we were heading north. Marty and Suzanne enjoy a long nap out on the front deck. With these seas it is way to rough to sight any whales. We do however have a beautiful view of the mainland mountain range off to our west. 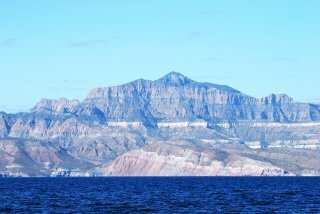 These 2000 foot high mountains are lit up with the morning sun and we can see many brightly colored rock layers along their slope. It reminds us of the rock formations in the Grand Canyon. After a 29 mile sail, Isla Partida comes into view. Just before entering our anchorage of Ensenada El Cardonal, we spot a group of manta rays doing summersaults. We wonder why they jump so high out of the water. It is a great way to end our sail. 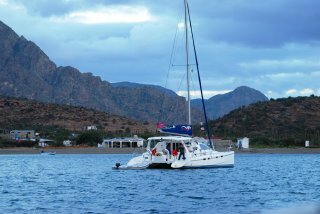 Even though this anchorage is well protected with mountains on both sides, the wind manages to funnel though a cut and it is quite windy. 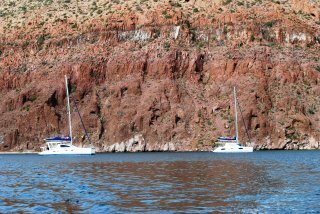 All of the catamarans were dragging anchor this afternoon and several had to reset during the night. We had wisely let out more scope before going to bed and we never budged after that. Our destination for this evening is only 6 miles south of here so we spend some extra time exploring on land before leaving our anchorage. At the head of the bay we follow the mile long trail through the cactus forest which dead ends on the eastern shore of the island. Here we find a hard rocky coast which is much more exposed to the sea. We next motor our dinghy over to the northern area of our anchorage where there was at one time an oyster farm. Here thousands of rocks were carried from shore to form an underwater foundation. The amount of labor required to do this is truly amazing. Jeff and Marty scramble up the steep mountain side to a cave 300 feet above the bay. This cave was originally used by Indians. They find many of the oyster shells inside. Back aboard Balajan, we hoist the sails at 11:30 and are soon battling the winds once again. The seas are still 6-8 foot and we are happy to be heading south. Our six mile sail goes quickly and we are to our evening anchorage within an hour’s time. 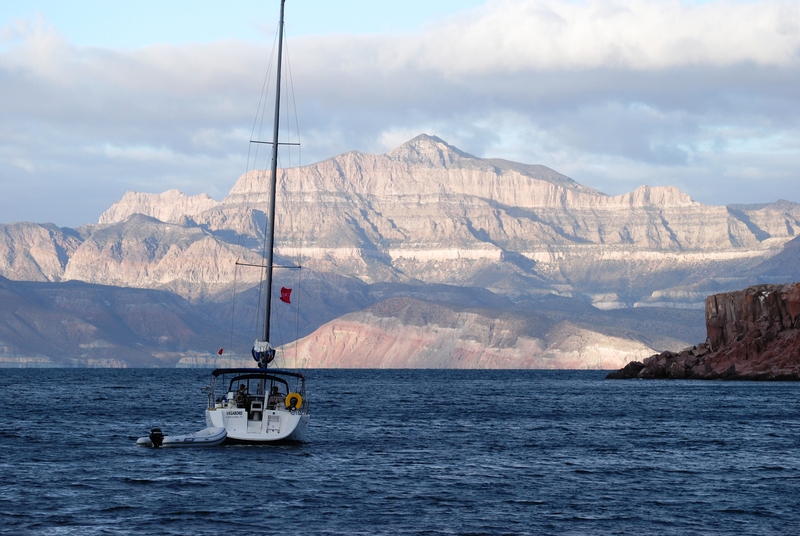 Once our sail is down, we anchor in the bay of Puerto Ballena at the anchorage area know as Ensenada de la Raza. 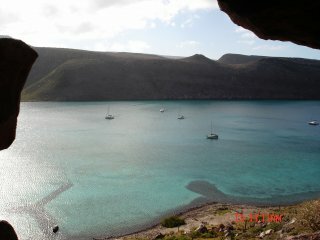 We are now back on the island of Espiritu Santo. We spend the remaining day aboard Balajan enjoying some good conversation with Marty and Suzanne. It is just too cold and windy to go ashore. Before we know it, it is 5:00 PM and cocktail hour. My, how the day goes quickly when in good company. Today will be our last full day of sailing. We are again the lead boat out of the anchorage and the others soon follow. 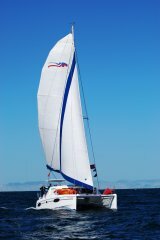 Although the winds are still blowing a good 20 knots, the seas have calmed down some and we have a great day for sailing. 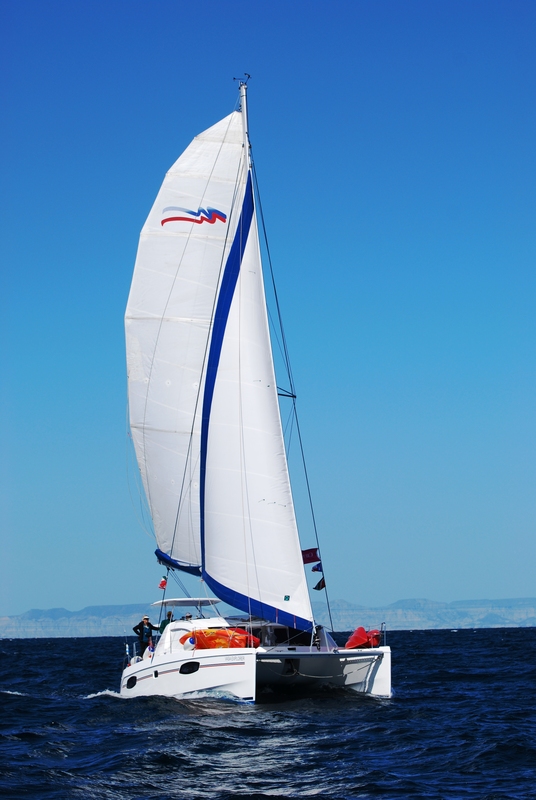 With both the main sail and jib fully raised, we tack and jibe across the open sea. 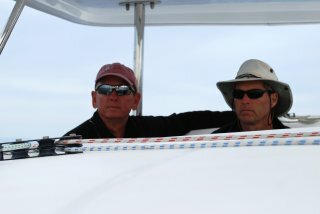 We continue to look for the elusive whales but just as with the previous days of sailing they are nowhere to be found. We have come to the realization that these whales are simply not around this week. 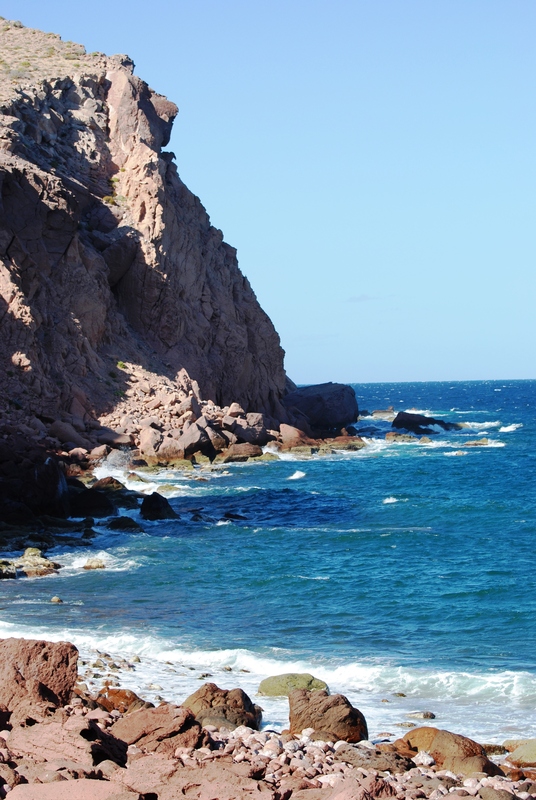 We saw many whale spouts out in the Pacific Ocean on our drive from the Cabo airport toLa Pazso we know they are in the Pacific just not in theSeaofCortezyet. We don’t let the lack of whales damper our sailing. Jeff and Marty have a great time of working the sails as they glide across the ocean. 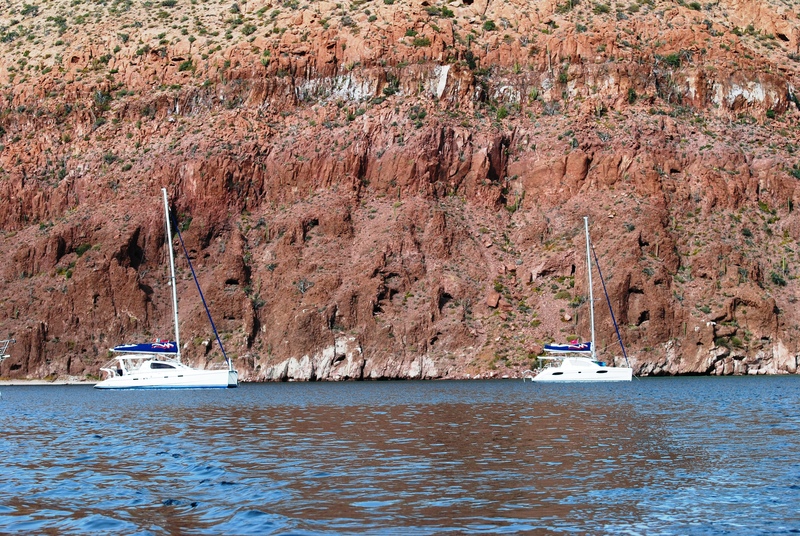 It is a fun day as we sail along side the other catamarans. 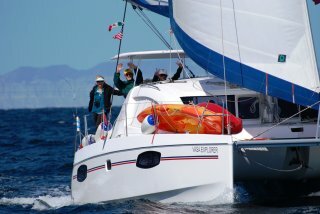 Who said power boaters can’t sail! At one point our guide, Jim. hailed us on the VHF asking what we were reaching for a top speed. I think he was surprised with our sailing ability. After several hours of great fun, all four boats anchor in Bahia San Gabriel. It is a beautiful spot to spend our last evening aboard. We have one last get together on the beach this evening with the other boats. It has been a great week getting to know our new friends and cruising together. And what better way to end our trip than with a fantastic sunset this evening. We are up this morning before sunrise as we have to have Balajan back to La Paz by 10:00 AM. Leaving our anchorage just as the sun begins to peak above the horizon, we say goodbye to the other boats. Although our boat is due back today, the other three charters have one more day of sailing. 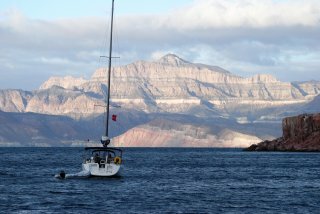 We have an easy 16 mile motor in the calm seas and soon find ourselves safely secured in La Paz. The cleaning crew is waiting for us at the dock and they waist no time getting Balajan turned around for the next charter. For us it is now only a memory. We have enjoyed our time in the Seaof Cortez. Although the whales failed to appear, the memories of beautiful anchorages, stunning scenery and great companionship will stay with us for years. 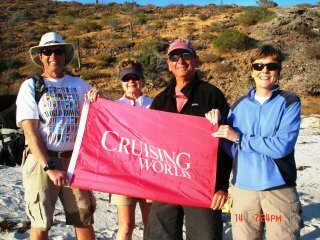 It was a fun time sailing with Cruising World and getting to know the others on the trip. Spending quality time with good friends Marty and Suzanne is always special. Having sailed 135 miles on this voyage, we have only begun to explore this 700 mile long sea. We along with Marty and Suzanne hope to one day be back in these waters aboard our own Krogen trawlers, Idyll Time and Alizann. This entry was posted on February 24, 2013 at 12:47 am. You can follow any responses to this entry through the RSS 2.0 feed. You can leave a response, or trackback from your own site. 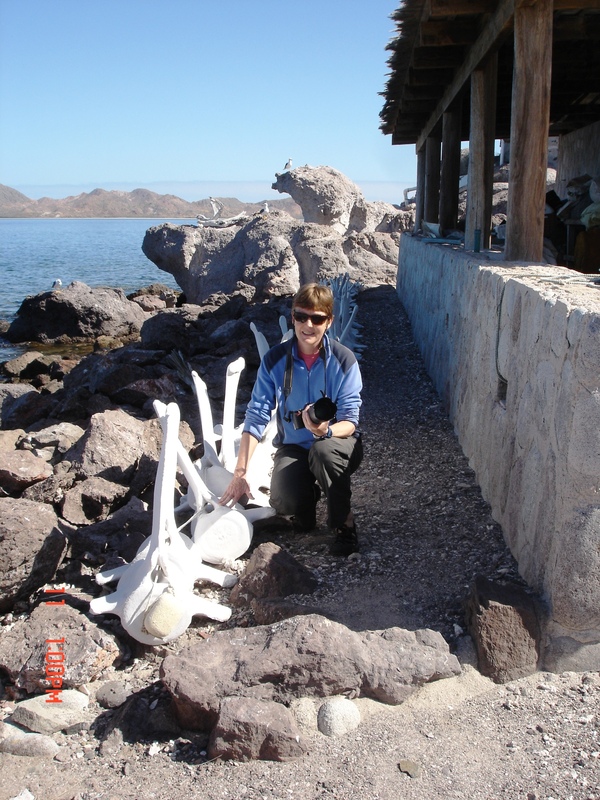 1 Response to "Exploring The Sea of Cortez"